"Whisper of a Rose" is a role playing game for the PC that has you playing as an young adult named Melrose. Melrose is a very bright girl but not a very well liked girl as she is always getting picked on at college by bratty women who don't know how to grow up, sadly that's the least of her problems. The worst of the abuse that Melrose is getting is from home as she has abusive parents that seem to hate her guts and force her to sleep in the basement. Ironically, Melrose is very free down in the basement as she gets time to work on her project which is a model of a castle. When Melrose has got free time from the house, she likes to go to the museum and one day at the museum she hears about experimental technology called the iDream. The iDream is a device that can take you to the land of your dreams, a land where the imagination knows no bounds. The next day Melrose gets invited to the museum office to hear some information about the iDream. In the small office we see Melrose getting desperate and so she steals the iDream because she is fed up of being in a world where she is treated like dirt. While running from security she manages to get the iDream running and it takes her to another dimension. This dimension is where stuff of fantasy and magic is real and where Melrose can be and will be a powerful warrior. Melrose sadly starts to learn that even the world of her dreams has it's fair share of problems... Not to mention that she is also being hunted by a crazy killer clown (not from outer space). How will she survive? (Click "Read More" to read the full review). "Rollers of the Realm" is an action packed pinball adventure game that's set in the time of kingdoms and knights. This game opens up with a tale about three legendary heroes that put the stop to an evil witch. Shortly after that story we are introduced to a young female rogue and her pet dog. Rogue is just your average street rat that likes to steal gold from passing strangers, sadly she gets into trouble with the authority and that leads to her dog getting taken away. Rogue is very upset about the situation but lucky enough she runs into a drunk old knight and he is willing to help get her dog back. Knight and Rogue manage to battle their way through the town and get back the dog but soon learn that a the Baron is trying to get away with something so dark, so evil, so gruesome, and so something that I'm not willing to spoil. Now our two heroes will have to fight through the Baron's men if they want to survive but the trip isn't as harsh as it seems as our heroes will meet more heroes that will join up with them to defeat the Baron. This is an adventure with balls and that's without a doubt. "Cherry Tree High Comedy Club" is an adventure game that has you taking the role of a spunky teenaged girl named Mairu. Mairu is part of a comedy act with her best friend, Hoemi (Hoemi is defiantly Mairu's homey *ba dum tish*) and during a conversation at the café where Hoemi works at we have Mairu telling her about something that happened earlier that day. What happened was that Mairu got a bright idea to bring back an old club called the Cherry Tree High Comedy Club, a place where students could practice their comedy acts. She tries to convince Chitose (of the student council) to let her review the club and gets some good news as she will be allowed to open up the Cherry Tree High Comedy Club... But there is a catch. Mairu has until the start of the next school term to convince four other students to join or otherwise they can't accept her request and the club won't be able to re-open. Mairu finds her first new club member quite easily as she asks Hoemi to join and she accepts. Finding three more members to join is the tough part but it isn't an impossible mission as Mairu is good at spotting potential members. Will Mairu complete her task to revive the Cherry Tree High Comedy Club? (Click "Read More" to read the full review). "ARMED SEVEN" is a futuristic side-scrolling schmup (shoot them up) set in the far future of the year 1989. Twelve years have past since the invasion of the Gogoh Army... Yeah, that's all the attract mode tells you about the story but thank goodness there's a description of the game (found on the game's Steam page) that tells what's going on in greater detail. The year is 1989, it has been twelve years since the Gogoh Army tried to take over Earth. Earth's war technology has advanced a great deal since being exposed to alien technology from the war but that's not all as Earth has also found peace within it's people, so they have formed a new united government called the Earth Federation. Sadly the peace is short lived as there is a group hell-bent on taking over Earth and creating a new world order. This group is called the Neo Loran Order and they've got some heavy duty machinery that can give the Earth Federation a run for their money. The most devastating machine the Neo Loran Order has is a crazy doomsday machine called the Armed Seven. You are playing as a soldier of the Earth Federation and your goal is to fight wave of Neo Loran Order machines of many sizes and take out all of their doomsday weapons (AKA bosses) and bring peace to the world. (Click "Read More" to read the full review). "Transformers - 30 Years of Optimus Prime" is a compilation disc that celebrates Optimus Prime and the Transformers thirtieth birthday. 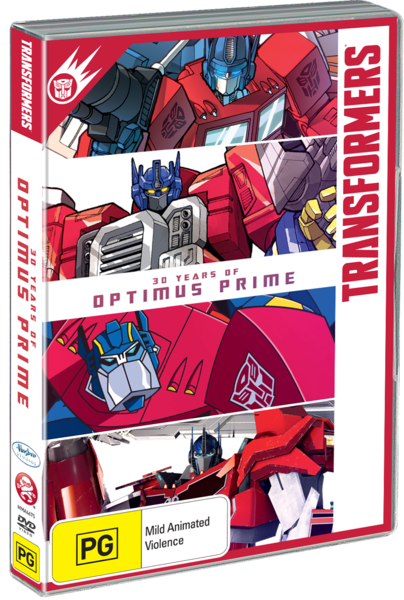 This compilation features five episodes from across several generations of Transformers and all of them highlight the greatest Autobot of all time, Optimus Prime. What episodes are included? Which generation of Transformers are they from? All will be explained after the jump as I'll be going over all episodes found on this compilation in greater detail. Transform and roll out. (Click "Read More" to read the full review). "Kill la Kill Volume Two" is the second helping of this action comedy series and I suggest checking out the review of the first volume (right here) to get a basic idea of what the basis of the show is about. This volume kicks off with a new character named Tsumugu Kingase, he is a person with a red Mohawk (that makes him look a bit like a roster) and a sniper rifle. What could he be doing with a sniper rifle? The answer wouldn't surprise you as he is after none other than the badass hero of the show, Ryuko Matoi. What may surprise you is that he isn't after her for fame, he is a hunter that hunts down magical suits and Ryuko Matoi is no exception as she dons her perverted magical suit, Kamui. Will she survive the attack? That's not all, also found in this volume we see that Ryuko Matoi is getting closer to reaching her goal at defeating the sinister beauty, Satsuki Kiryuin. Sadly there is a huge roadblock in our heroes way as she is now being challenged by Satsuki Kiryuin's personal bodyguards, the Elite Four (not the same from Pokémon as I can assure you). First member of the Elite Four is a guy named Uzu Sanageyama and he is super fast and super skillful with a kendo stick. How does one survive a crazy high school like this? The journey of Ryuko Matoi in the school from hell continues in this second volume of Kill la Kill. (Click "Read More" to read the full review). "A Good Snowman is Hard to Build" is a puzzle game for the PC and has you playing as a character that looks like a huge chocolate chip. The character you play walks into a park only to get locked in. The way the giant choc chip man/woman/other has to get out is by building snowmen (I'M NOT DOING THE REFFERENCE!) and the way you build snowmen is by putting together a small snowball, a medium snowball, and a large snowball by pushing them into each other. Sometimes it is not as simple as that as not all snowballs start off the right size and you'll need to push them across patches of now to make them the right size and sometimes you'll have to find clever ways to avoid snow patches otherwise your balls will get too big and you can't connect them together. Very simple stuff indeed but will there be any complications that will ruin the experience? Or will this game be a winter wonderland? (Click "Read More" to read the full review). "SLAMMED!" is a text based choose your own adventure game for the PC. You get to play as a wrestler whose in the indie circuit, on the cusp on making it to the big leagues of wrestling. All is going well until you read the latest issue of your favorite wrestling magazine and feel like that you've seen a ghost. What you see is your former best friend, he has made the list for "best wrestlers of the year" and that shocks you. You and your former best friend do not get along as they had a very nasty falling out that involved a drink driving accident. Now your ambitions are much bigger and stronger and now you fight much harder to become a true professional wrestler. Will you become a professional wrestler? Will you make amends and become best friends once again? Or will you do your best to accomplish both goals? The choice is yours as this wrestling game gives you the power of being able to choose your own path... TO DESTRUCTION! (Click "Read More" to read the full review).